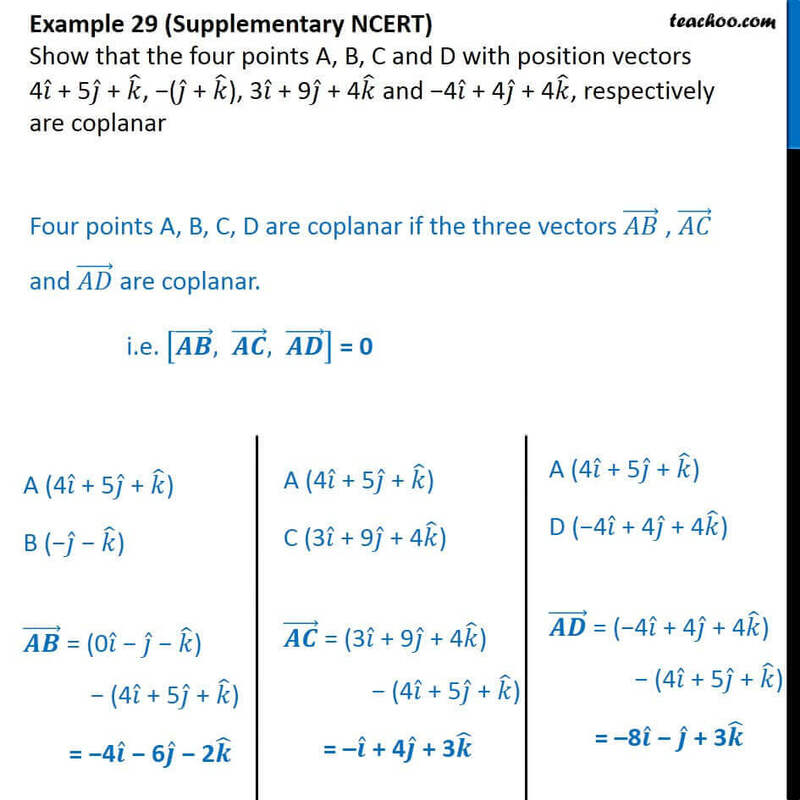 Example 29 (Supplementary NCERT) Show that the four points A, B, C and D with position vectors 4 + 5 + , ( + ), 3 + 9 + 4 and 4 + 4 + 4 , respectively are coplanar Four points A, B, C, D are coplanar if the three vectors ( ) , ( ) and ( ) are coplanar. i.e. 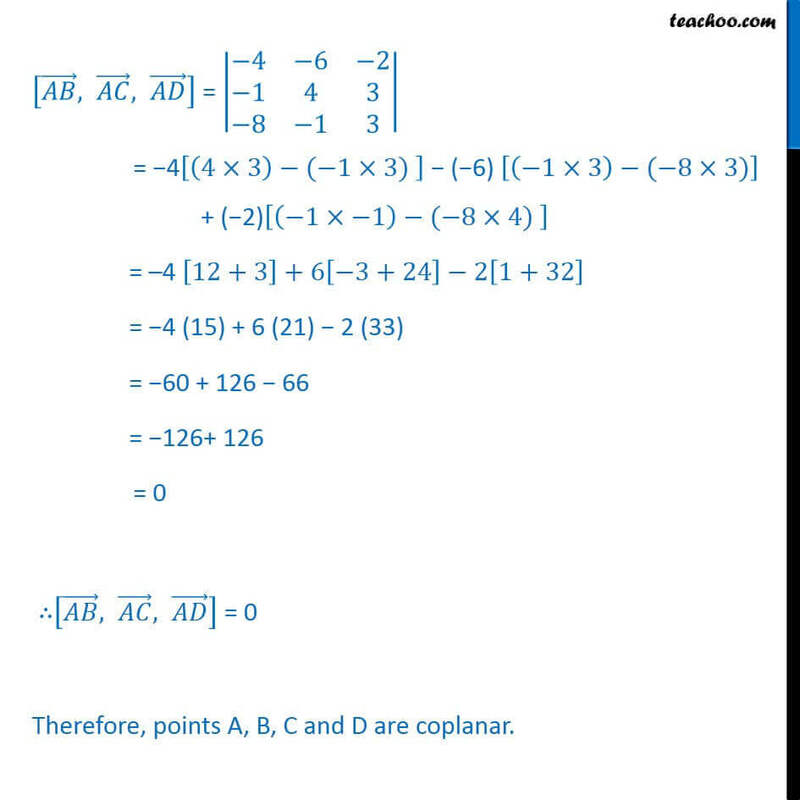 [( ) , ( ) , ( ) ] = 0 A (4 + 5 + ) B ( ) ( ) = (0 ) (4 + 5 + ) = 4 6 2 A (4 + 5 + ) C (3 + 9 + 4 ) ( ) = (3 + 9 + 4 )	(4 + 5 + ) = + 4 + 3 A (4 + 5 + ) D ( 4 + 4 + 4 ) ( ) = ( 4 + 4 + 4 ) (4 + 5 + ) = 8 + 3 [( ) , ( ) , ( ) ] = | 8( 4& 6& 2@ 1&4&3@ 8& 1&3)| = 4[(4 3) ( 1 3) ] ( 6) [( 1 3) ( 8 3)] + ( 2)[( 1 1) ( 8 4) ] = 4 [12+3]+6[ 3+24] 2[1+32] = 4 (15) + 6 (21) 2 (33) = 60 + 126 66 = 126+ 126 = 0 [( ) , ( ) , ( ) ] = 0 Therefore, points A, B, C and D are coplanar.